Here is another great Sweepstakes! 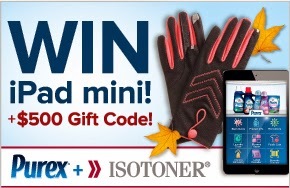 Purex and Isotoner are teaming up and offering a great prize. ISOTONER smarTouch gloves keep your hands warm while using your touch screen devices. Keep them bright and clean all winter long with Purex liquid detergent and WIN! You could WIN an iPad mini and a $500 Isotoner shopping spree! You can go here for your chance to win!